What on earth happened? The combination of the Chicano performance troupe, Culture Clash, and the Mark Taper Forum has been wonderful in the past. With Palestine, New Mexico they have gone astray. You will know how far they have wandered when I tell you that the best part is it is only 80 minutes long. Palestine is the result of Robert Montoya’s three-year “anthropological” exploration of New Mexico’s crypto-Jews. His curiosity was piqued by his mother’s tales of small New Mexican towns where tongues would wag if one were seen to be improperly advancing the Rosary. Saying to himself, “It’s time someone told me why all my aunts look like Yenta from Fiddler on the Roof,” he set off on his exploration. The crypto-Jews make an interesting subject. They are descended from Jews who had converted to Catholicism during the Spanish Inquisition. Thought to have come to the new world as servants and slaves in the holds of galleons, they married into the Latino culture; remnants of their Judaic heritage are still to be found in New Mexico. Montoya knows how to weave history into an entertaining, informative drama. Chavez Ravine and Water and Power, both of which premiered at the Taper, were informative, accurate, irreverent, and touching. Not so this time. Palestine seems closer to a production written by a smart high school kid and acted by his peers, rather than one by a very polished. Look, anyone can take a wrong step, but did anyone stand back and ask if the final product was any good? Rather, it gave the impression of having been rushed into production. For the most part the characters are caricatures and stereotypes. 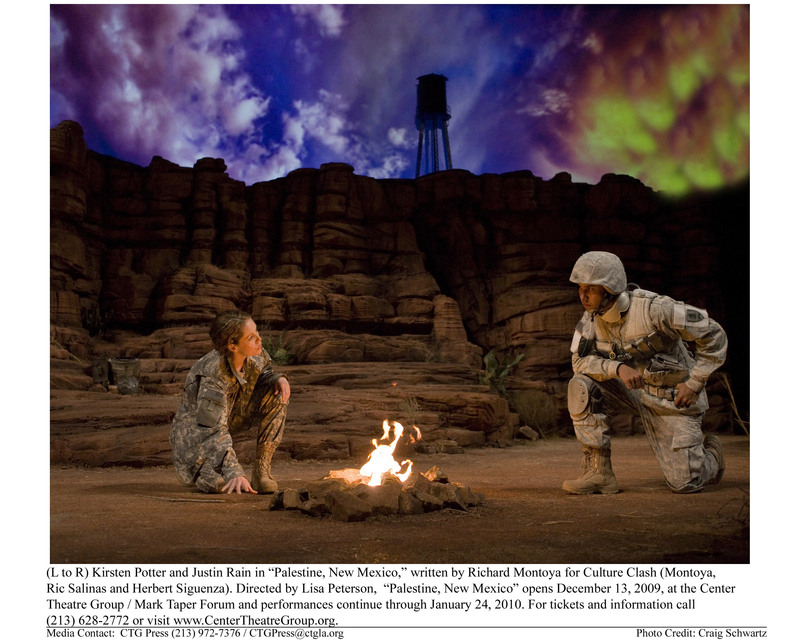 A very brief synopsis: An army captain (unconvincingly played by Kristen Potter) has come to an Indian reservation in the Sangre de Cristo Mountains of New Mexico (beautifully represented by Rachel Hauck’s stage set). Her mission is to deliver a letter to the chief written by his son who has been killed in Afghanistan. She is clearly suffering from Post Traumatic Stress Disorder and has been shaken by the young soldier’s death. She feels pursued by the son’s ghost and has flashbacks and a vivid peyote induced fantasy, which included such nifty items as a huge walking cactus. Men of the tribe confront her in a macho show of bravado complete with automatic weapons, trying to throw her off the reservation and prevent her from seeing the chief. As the young soldier lay dying in her arms he said, “Suarez,” which she took as a clue that might explain something more about the death. Whenever she asks someone on the “rez” about “Suarez” they recoil and she learns the reason behind this in bits and pieces: the chief’s great grandmother was chased, or fled, off the reservation because of the unpopular (Jewish) customs she followed. She married a Suarez and they established their own despised tribe – with Jewish traditions embedded in Catholic practices . The Suarez village is right next door. Suarez was thus the dead soldier’s cousin. Ultimately — after a few more flashbacks, an intercession by Maria 15, the medicine woman (the very funny Geraldine Keams), and the wallop of peyote leading to the ultimate combination bad trip/flashback , the chief (a stoic Russell Means) appears. The father and son had a poor relationship with bad communication. The letter is ultimately read by the chief and all is resolved. Too bad it is graveside. This is a very simplified version of the plot, but it should do. The references to Judaism are not subtle. A full sized menorah is found hidden in the rocks then flashed repeatedly; one member of the cast sports a large Star of David with a cross hanging from it, and Yiddish words are sprinkled liberally. This all leads to the impression that it was written to appeal to synagogue theatre parties for the sisterhood, an apparently successful marketing tool as one small section of the audience was audibly much more amused than the rest of us. Strangely, despite Montoya’s professed ancestral connection to the material, and despite the presence of America’s most famous living Indian, Russell Means, Palestine, says more about Jewish culture than that of the Native Americans. The bottom line, if not yet gleaned, is that unless a miracle occurs, Palestine, New Mexico should probably be put to rest. Some scripts are too messy and too far-gone for CPR.